A swashbuckling middle-order batsman and occasional medium-pace bowler, Mark Nicholas made 36 centuries (including two against Australia) for and skippered Hampshire to four major trophies, the Benson & Hedges Cup in 1988 and 1992, the Sunday League (now National League) in 1986, and the NatWest Trophy (now C&G Trophy) in 1991. Since retiring from cricket, Mark worked for 12 years as London’s Daily Telegraph’s sports feature writer before moving into television broadcasting, initially as a commentator for Sky Sports and later as the anchor on Channel 4’s cricket coverage. Mark is now the face of the Nine Network’s Summer of Cricket. Mark was named UK Sports Presenter of the Year in 2001 and 2005 by the Royal Television Society, presented the second series of the UK version of the reality show Survivor, anchored the afternoon coverage of Nine?s broadcast of the 2006 Melbourne Commonwealth Games as well as Nine’s coverage of the 2006/07 Ashes Series. In 2007, Mark was a member of the commentary team for the Cricket World Cup in the West Indies. Mark is a part time columnist and is presently hosting ITV1’s fourth series of Britain’s Best Dish. 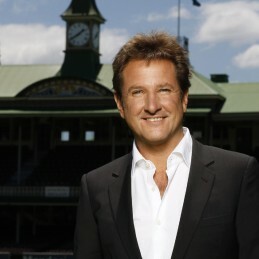 Mark Nicholas has charisma aplenty, genuine stage presence and is highly regarded across all media for his commentary and as an awards host and public speaker.